Students are increasingly organising themselves around co-operative values and principles, providing goods, services and housing to their members. There are a growing number of student housing co-ops (in Sheffield, Birmingham, Edinburgh…), an emerging national body of student housing co-operatives, a national federation of student co-ops, and a new network of young co-operators led by AltGen, an organisation that supports young people to set up their own worker co-operatives. Highlights from Young Co-operators Weekend in Bradford from Blake House on Vimeo. 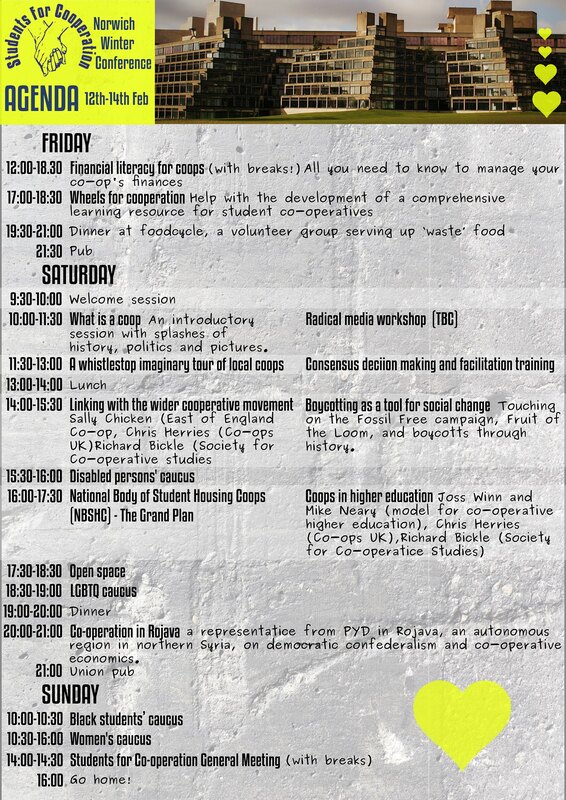 Students for Co-operation are holding their national winter conference at the University of East Anglia, February 12-14th, and I will be attending again to jointly run a workshop on co-operative higher education. Mike Neary and I attended a national meeting last June to run a workshop on co-operative higher education at the start of our ISRF-funded research project. Now approaching the end of the project and having run five more workshops on different themes relating to co-operative higher education since then, it will be good to return and discuss some of our findings. I begin this article by discussing the recent work of academics and activists to identify the advan- tages and issues relating to co-operative forms of higher education, and then focus on the ‘worker co-operative’ organisational form and its applicability and suitability to the governance of and practices within higher educational institutions. Finally, I align the values and principles of worker co-ops with the critical pedagogic framework of ‘Student as Producer’. Throughout I employ the work of Karl Marx to theorise the role of labour and property in a ‘co-operative university’, drawing particularly on later Marxist writers who argue that Marx’s labour theory of value should be understood as a critique of labour under capitalism, rather than one developed from the standpoint of labour. You can download this article from the journal, Power and Education. A pre-print version of this article is available from the University of Lincoln research repository. An earlier and expanded version of this paper given at the ‘Governing Academic Life’ conference is also available from the University of Lincoln research repository. My keynote talk for Newcastle College’s Student as Producer conference, March 27th 2015. Thank you for inviting me here today to contribute to your student conference. It’s a real privilege and luxury to be able to spend the day with you and to learn about all the great work you’re doing. Last year, my friend Prof. Mike Neary spoke at your ‘Student as Producer’ conference. Mike and I have worked together and with many other colleagues on Student as Producer for a number of years now and within our own institution and elsewhere, such as Newcastle College, the core ideas of Student as Producer are interpreted in new ways and take on new forms. At Lincoln, since our original HEA-funded project ended, Student as Producer has developed into a substantial programme of ‘student engagement‘ led by Dan Derricott, an ex-Vice President of our Student Union. At the University of Warwick, the Institute for Advanced Teaching and Learning funds Student as Producer projects relating to research, collaboration or performance. At Vanderbilt University in the USA, 2014 was themed the year of Student as Producer. At the University of British Columbia in Canada, funding has been made available for the redesign of 100 courses, affecting around 34,000 student enrolments. These are just some of the examples of Student as Producer being put into practice, expressed in words like ‘engagement’, ‘collaboration’ and ‘partnership’. I know that Newcastle College has a new ‘HE Partnership Strategy’ based on the ideas of Student as Producer. I want to introduce, or rather recover, another word that is essential to my own understanding of Student as Producer and that is: ‘co-operation’. I’ll explain what I specifically mean by this in a minute. First though, the title of my talk today probably requires some explanation: ‘A short history of hacking: Values and principles for co-operative higher education.’ The first part of the title refers to work I did on Student as Producer during 2009-2014. The second part refers to my current work, which I see as a development of Student as Producer, while remaining true to its original principles. What has ‘hacking’ got to do with Student as Producer? When you hear the word ‘hacking’ or ‘hack’, many of you may think of something malicious and illegal, such as ‘someone’s hacked into my Facebook account’, or ‘the News of the World has been accused of phone-hacking’. However, an earlier meaning of ‘hacking’ was first used in the late 1950s by teachers and students belonging to the Tech Model Railroad Club at the world renown Massachusetts Institute of Technology (MIT). Even today MIT maintains a ‘Hack Gallery‘ which records various audacious and creative pranks undertaken around campus over the decades. In 1959, ‘hack’ at MIT referred to “something done without constructive end” and, according to records kept at that time, a year later a ‘hack’ specifically referred to “an article or project without constructive end.” It was, “a term for an unconventional or unorthodox application of technology, typically deprecated for engineering reasons.” A ‘hacker’ of course, is someone who hacks, but more specifically, “a hacker avoids the standard solution.” Since the early 1960s, the terms hack, hacker and hacking have taken on a variety of related and nuanced meanings and among computer scientists, electronics enthusiasts and software developers it’s still regarded as an honorary term for someone who is clever, creative, has unusual expertise and enthusiasm for their work and are defacto members of a global community of hackers who collaborate through the Internet. In my own work on Student as Producer at Lincoln, I originally focused on the research and development of institutional technology with students and our recent graduates. We mainly worked on projects relating to the infrastructure of the university: things like a research data management system, web publishing systems, identification and authentication protocols and curriculum data anlaysis. Throughout these projects, I referred to our work as ‘hacking the university‘ (actually, I was never creative nor clever enough to be a hacker, but some of the students I worked with truly were). During this time, we were trying to re-think and ultimately re-engineer the fabric of the university around the idea of ‘openness’: Open technologies, open data, open ways of doing research and teaching and learning. The point being, that Student as Producer is not simply about partnership, engagement, and collaboration – although it is all those things. It’s about confronting the idea of higher education and the institutional form that it takes so that as we produce new knowledge, which is what distinguishes a higher education, we reflect deeply on the means of knowledge production itself. What I’m leading to is that, as you know, Student as Producer is much more than research-engaged teaching and learning. It is a pedagogical framework but one that is intended for rebuilding or re-engineering knowledge production itself. It’s anticipated that the institutional form reflects the pedagogic principles rather than the other way around. At Lincoln, it’s “the central pedagogical principle that informs other aspects of the University’s strategic planning” articulated currently in a major initiative to involve students in the running of the university. This brings me to the second half of my talk where I want to look forward rather than backwards and think about how Student as Producer can be developed further. One of the exciting and sometimes frustrating things about working with hackers is that they are always retooling. By this, I mean that they are always looking for ways to improve the tools they are working with and in doing so, the process of production itself. It reflects the fact that software developers often have the ability to author or improve the software tools that will help them develop new software products, a bit like a carpenter who can fashion a better carpentry tool so as to improve their cabinetmaking. This reflects the deep level of knowledge about the process of software production that hackers have. When they run into problems in the development process, hackers often have the knowledge required to address the problem, whether it’s an irritating bug or an inefficiency in the system. Furthermore, they often have the autonomy to make that intervention, because the tools they use are open source and can be freely modified. And because they’re open source there is a community of other hackers they can co-operate with on the problem at hand, if they themselves aren’t quite sure how to fix it. Knowledge, autonomy, openness, community, co-operation are all required if we are to “work on the means of [knowledge] production”. And when we are able to genuinely work on the means of knowledge production, through the principles of openness, autonomy and co-operation, it can have a ‘recursive‘ effect on our understanding of the world around us and embolden us to desire and demand these principles in other aspects of our social lives. The point I want to underline here is not the simple assertion that students should be recognised and included as part of the research activities of higher education – of course they should – but that if we remain true to that objective, the fabric of the institution, or the ‘means of production’, has to change too, including the way the institution is governed. Which is where I come back to the idea and practice of ‘co-operation’. Student as Producer has always had a radically democratic agenda, valuing critique, speculative thinking, openness and a form of learning that aims to transform the social context so that students become the subjects rather than objects of history – individuals who make history and personify knowledge. Student as Producer is not simply a project to transform and improve the ‘student experience’ but aspires to a paradigm shift in how knowledge is produced. 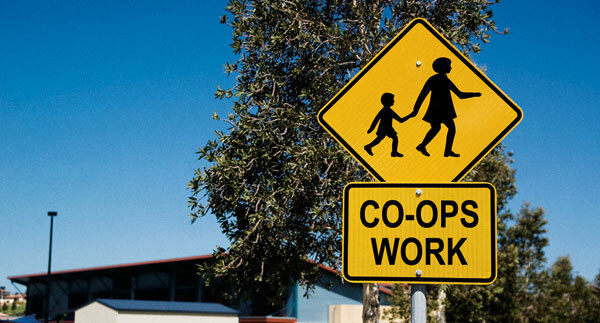 The co-operative principles are: Voluntary and Open Membership; Democratic Member Control; Member Economic Participation; Autonomy and Independence; Education, Training and Information; Co-operation among Co-operatives; and Concern for Community. As you can see, education is one of the key principles for the international co-operative movement, but I want to draw your attention to the other principles of open membership, democratic control, autonomy, co-operation among co-operatives, and concern for community. The choice of these values and principles has been discussed, debated and refined over the 170 year history of the international co-operative movement and last agreed in 1995. This combination of values and principles does not take a single institutional form (as you know, co-ops are multivarious in the forms they take) but like Student as Producer, I think they offer a framework for re-engineering the governance of higher education and the production of knowledge in our so-called ‘knowledge economy’, enabling teachers, students, administrators, cleaners, caterers… to democratically control our institutions. Newcastle College should be commended for recognising the need to involve students in the governance of your institution. In your own HE Partnership Strategy you state that “meaningful partnership working is reliant upon the equal distribution of democratic power.” You argue rightly that this isn’t just achieved by listening to the so-called ‘student voice’ but by “empowering students to drive and implement change.” And “this will involve redistributing power across our HE communities up to and including HE Academic Board through engaging students in all stages of the decision making process.” My question to you is how do you intend to constitute this form of democracy. You say that you will embed it “throughout all aspects of the HE learning experience” but what constitutional form will that take and how will you hold each other to account? These are not questions unique to your own stated objectives, but are being asked all the time by people who desire democracy in their work as they do in their politics. The question I am interested in then, is what steps might we take to reconstitute and transform our institutions into member-run, democratically controlled co-operatives? Institutions that enable us to reflect deeply on the conditions of present day knowledge production and truly put Student as Producer into practice? Since 2011, academics and individuals within the co-operative movement have been discussing this question, partly inspired by the way 800 schools in the UK have recently become co-operatives. We are writing about co-operative higher education for journals and books, talking about it at conferences like this one, and thinking of ways that colleges and universities can become actual co-operatives or at least more like co-operatives. The suggestions range from converting the whole institution into a co-operative, constitutionally and legally, to running parts of the institution co-operatively, such as courses, research groups, committees and the various services that operate with and within colleges and universities. Staff and students could also be encouraged and supported to create their own co-operatives both inside and outside the university, setting up housing co-ops, food co-ops, technology co-ops, and even community-run education co-ops, joining a growing federation of student co-ops in the UK. In the course of this process of transformation, as we learn how to practice democracy, autonomy, openness and solidarity, I expect that the ‘recursive’ effect will begin to take effect and we’ll want to assert these principles in other areas of our lives, too, demanding a similar transformation in the social world we are part of. That’s what Student as Producer is all about. “But there was in store a still greater victory of the political economy of labor over the political economy of property. We speak of the co-operative movement, especially the co-operative factories raised by the unassisted efforts of a few bold “hands”. The value of these great social experiments cannot be overrated. By deed instead of by argument, they have shown that production on a large scale, and in accord with the behests of modern science, may be carried on without the existence of a class of masters employing a class of hands; that to bear fruit, the means of labor need not be monopolized as a means of dominion over, and of extortion against, the laboring man himself; and that, like slave labor, like serf labor, hired labor is but a transitory and inferior form, destined to disappear before associated labor plying its toil with a willing hand, a ready mind, and a joyous heart. In England, the seeds of the co-operative system were sown by Robert Owen; the workingmen’s experiments tried on the Continent were, in fact, the practical upshot of the theories, not invented, but loudly proclaimed, in 1848. At the same time the experience of the period from 1848 to 1864 has proved beyond doubt that, however, excellent in principle and however useful in practice, co-operative labor, if kept within the narrow circle of the casual efforts of private workmen, will never be able to arrest the growth in geometrical progression of monopoly, to free the masses, nor even to perceptibly lighten the burden of their miseries. It is perhaps for this very reason that plausible noblemen, philanthropic middle-class spouters, and even keep political economists have all at once turned nauseously complimentary to the very co-operative labor system they had vainly tried to nip in the bud by deriding it as the utopia of the dreamer, or stigmatizing it as the sacrilege of the socialist. To save the industrious masses, co-operative labor ought to be developed to national dimensions, and, consequently, to be fostered by national means. Yet the lords of the land and the lords of capital will always use their political privileges for the defense and perpetuation of their economic monopolies. So far from promoting, they will continue to lay every possible impediment in the way of the emancipation of labor. Remember the sneer with which, last session, Lord Palmerston put down the advocated of the Irish Tenants’ Right Bill. The House of Commons, cried he, is a house of landed proprietors. To conquer political power has, therefore, become the great duty of the working classes. They seem to have comprehended this, for in England, Germany, Italy, and France, there have taken place simultaneous revivals, and simultaneous efforts are being made at the political organization of the workingmen’s party. I have recently finished Peter Hudis’ book, ‘Marx’s Concept of the Alternative to Capitalism‘. It is one of the most interesting and useful books that I’ve read in some time. Below, he discusses the topic of the book with reference to Occupy, worker co-ops and other contemporary responses to capital. The audio significantly improves from one minute into the talk and his talk ends at 55 minutes when he takes questions. Of particular interest to me is the outline his gives (around 36 mins in) of what Marx deemed necessary to eliminate the conditions of alienating value production i.e. freely associated, non-alienated labour. As I’ve mentioned before, I am one of several scholars participating in the Social Science Centre’s course on ‘Co-operation and education‘. This week (week five), we were discussing co-operative values and principles, with a particular focus on ‘autonomy’ (4th principle) and ‘democracy’ (2nd principle). The reading for this week was Ian MacPherson’s ‘Speech Introducing the Co‐operative Identity Statement to the 1995 Manchester Congress of the ICA’, and the article on democracy from the Stanford encyclopedia of philosophy. 1. Democracy is “the essence” of the political. It is more than its legal, juridical form. In his 1844 Manuscripts and 1843 Critique of Hegel’s Philosophy of Right, communism and democracy are described separately in the same terms. I understand this to mean that rather than the state being an abstraction set apart from people, under a true democracy the people constitute the state (they are the “essence of the political”) to the extent that the state as a determinate abstract force in society is negated. True democracy is stateless. It is literally the ‘rule of the people’, expressed through social, human existence. 2. Democracy does not require the participation of all members of society as individuals in the decision-making process. Both direct or representative participation is to falsely conceive of the problem. Membership in a true democratic society does not demand participation in the state. The artificial distinction between society and the state is wrong in the first place. “In its proper form the opposition is this: the individuals participate as all, or the individuals participate as a few, as not all. In both cases allness remains merely an external plurality or totality of individuals. Allness is no essential, spiritual, actual quality of the individual. It is not something through which he would lose the character of abstract individuality. Rather, it is merely the sum total of individuality. One individuality, many individualities, all individualities. The one, the many, the all – none of these determinations changes the essence of the subject, individuality. To consciously ‘be’ is more than to simply ‘participate’ in something. One’s existence is already participation to the extent that the state can only exist as a form of the social existence of all individuals. What ‘activates’ this integration or transcendence is being/becoming conscious of such an existence. Marx recognises that “it is a tautology that a member of the state, a part of the state, participates in the state, and that this participation can appear only as deliberation or decision”. This is a reminder, I would add, that in capitalist society, efforts towards ‘equality’ serve the purpose of ensuring everyone equally has the opportunity and capacity to sell (exchange for money – a wage) their labour power, the source of capitalist wealth (value). Marx showed that this is so-called ‘freedom’ under capitalism. Rather than view civil society equally and quantitatively as an abstract ‘population’ of individuals, Marx showed how the abstraction of exchange, (based on abstract labour, the measure of which is socially necessary labour time), is the necessary basis of capitalism’s equality. Human need and the capacity to produce goods and services to meet those needs is the precondition for an equality based on exchange, which capitalism exploits by separating individuals from the means of production (private property) such that they have to sell their labouring capacity in exchange for a wage so as to meet those needs through the exchange of money. Human need and capacity are mediated indirectly through the abstract equivalence of value in the form of money, rather than the direct and reciprocal labour of individuals. This commodified relationship under capitalism, where both labour-power and its product is commodified , is in one sense unequal in that the labourer is paid less than her labour is worth. For a portion of the day, she works for ‘free’, enabling her employer, the capitalist, to sell the product of labour power for a value which is higher (i.e. not equivalent) than it cost them to produce. Thus, value, the substance of which is abstract labour measured by socially necessary labour time (time, being the ultimate measure of equivalence), determines human equivalence in capitalist society and not the direct meeting of human needs and capacity i.e. inequality (what Marx, in the Grundrisse, called “natural differences”). Thus, the struggle to achieve legislative power is the struggle of civil society to “transform itself into political society, or to make political society into the actual society… [this] shows itself as the drive for the most fully possible universal participation in legislative power.” (Marx) Legislature then, is “an articulation of the political will of the community as such”. (Springborg) Marx argues that it is not the depth of engagement in legislature but the universalism of suffrage that is key, whether active or passive. In theory then, universal suffrage transforms, for the first time, the existence of civil society into a political existence. The political state is no longer an abstraction and civil society, its dialectical opposite, is dissolved, too. The outcome of the synthesis of this dialectic, enabled by universal suffrage, is the political existence of all transformed into true social existence. This dissolution, I think, is resolved gradually through the praxis of consciously becoming political: At first with the struggle towards universal suffrage; and then the struggle to understand what this means philosophically and recognise that out-dated and out-moded legislation is no longer deemed suitable or necessary to the historical material conditions of this political existence. Such conditions are conditions of abundance that allow the “natural differences” among people to labour directly with one-another reciprocally, not mediated by the equivalence of exchange value. To labour ‘directly’ does not necessarily mean ‘local’ to one-another face-to-face, but rather directly meeting need with capacity regardless of and without concern for ‘equivalence’. What does this mean for democracy, equality and freedom in post-capitalist society? Democracy will be the social existence of individuals who no longer have a juridical existence quantified by an abstract state. A political existence is to be (ontologically and epistemologically) a social human being. i.e. not an individual. Equality will be mutual recognition of the difference in our needs and capacities i.e. inequality. Freedom will be a life of non-reciprocity where ‘equivalence’ is redefined as the meeting of one person’s needs with the abundant social capacity of others. It will be a freedom which tends to our natural differences (not ‘natural rights’), undetermined by ‘exchange’ conceived as an abstract calculation of one’s value.